The official PlayStation 3 3D Display will be available in November, and some of you may still have some questions around how it works, the specification and more. The PlayStation.Blog has kindly put together a detailed FAQ featuring questions from the PlayStation community. Check out the Questions and Answers below. When will the 3D Display be available? The 3D Display will be widely available on November 13, 2011. I pre-ordered the PlayStation 3D Display from a retailer that was offering a free copy of Resistance 3, but I notice that the promotion is no longer being promoted on the website. Am I still getting Resistance 3 for free? Yes. If you pre-ordered the PlayStation 3D Display from a retailer that advertised a free copy of Resistance 3 on or before September 30, 2011, you will still be getting a copy of the game with your shipment. The offer officially ended on October 1st, 2011 and that’s the reason retailers had taken down the promotion from their website. The 3D Display was made to play 3D games right out of the box. For the MSRP of $499.99, you get the 3D Display, one pair of 3D Glasses, MotorStorm Apocalypse Blu-ray game, and an HDMI cable. All you need to do is hook up your PS3 system and you’re ready to go. Does the 3D Display work in normal 2D mode? Yes. You can choose to play games and watch movies in regular high-definition 2D. What’s the difference between Active 3D technology used on the 3D Display and Passive 3D technology used on Passive 3D displays? The most notable difference between the two is the 3D resolution. With active 3D, you get full HD 3D playback. With passive 3D, you will get half the resolution. Active 3D displays require active 3D glasses and passive 3D displays require polarized passive 3D glasses. 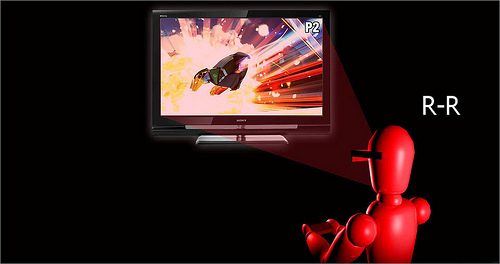 The 3D Display supports active 3D and the highest resolution. What 3D games are available right now on the PS3 system? A full list of currently available 3D games is available here. Check back soon — it’s updated frequently! What inputs and outputs does the 3D Display support? The 3D Display features two HDMI 1.4 inputs and one component cable input, plus a stereo headphone output. What does Edge LED backlighting and 240Hz refresh rate mean? Edge LED backlighting offers improved contrast and brightness relative to normal (CCFL) LCD displays. Additionally, the technology allows for a super slim design. 240Hz is currently the best-in-class refresh rate. With such a high refresh rate, you get reduced crosstalk in 3D mode, which realizes clear 3D images. What does the integrated subwoofer do? Is the built-in sound superior to comparable displays? The 3D Display’s integrated subwoofer enhances low-frequency audio, giving an extra kick to bass-filled sound effects. This means that booming explosions, growling demons, and throaty engines will sound more immersive compared to the tinny audio provided by many display speakers. You can also connect a stereo headphone jack and use your favorite pair of stereo headphones, or use the new Wireless Stereo Headset that interfaces directly with your PS3. What is the advantage of SimulView? This special two-player feature is unique to the 3D Display in that it significantly enhances two-player mode in select games. Ordinarily, two-player mode is played in split-screen format. 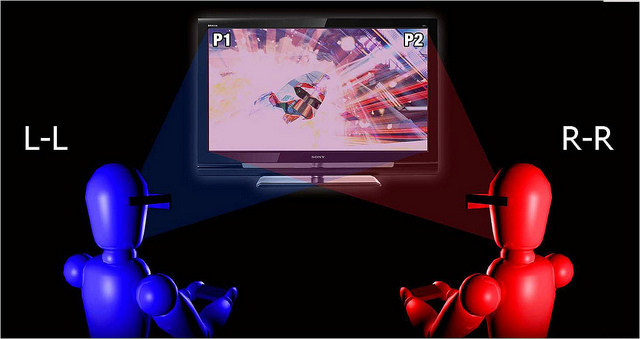 With this unique two-player feature, each player gets their own full (2D) HD screen while wearing the 3D Glasses for the 3D Display. Can I use SimulView with other Sony 3D TVs? At this time, the 3D Display is the only display on the market that supports the SimulView two-player gaming feature. What will I need to play a game with this special two-player feature? The 3D Display, two pairs of 3D Glasses for the 3D Display, a PS3 system, a PS3 game that supports the special two-player feature, and a buddy. What games support the SimulView feature as of launch? Will future games support SimulView? At launch, you’ll be able to play MotorStorm Apocalypse, Gran Turismo 5, Killzone 3, and Super Stardust HD. We’ll have more titles to share soon. Do both players need to use the new 3D Glasses for SimulView to work? Yes. Each player will need to have a pair of the 3D Glasses for the 3D Display as these are currently the only 3D glasses available that support SimulView. Do you expect that any existing games will be updated to add SimulView support? Yes. We are continuing to evaluate all games that would be candidates for SimulView and working individually with each respective development team to determine if enabling SimulView makes sense. Will the 3D Display work with anything other than my PS3 system? Absolutely. While the 3D Display is optimized for any HD gaming console, it features three HD inputs (two HDMI, one component) that allow you to connect to your PS3 system, cable TV box, and PC. You can also connect your PS2 and PSP using their component video output..
What resolutions does the 3D Display support? Any resolution up to and including 1080p (1920 x 1080 progressive scan). Why are the new 3D Glasses better than current offerings? The 3D Glasses are noticeably lighter and less obtrusive than existing active 3D glasses. Due to advancements in 3D technology they also suffer from less “crosstalk” in 3D images. They also feature an integrated rechargeable battery that you can charge using the included micro-USB cable instead of installing a new battery. The new 3D Glasses also support the SimulView feature, which enables two players to enjoy their own full (2D) screen while wearing the 3D Glasses for the 3D Display in supported games. 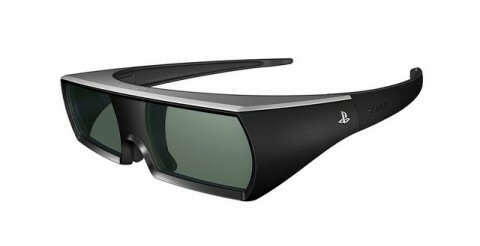 Finally, retailing at $69.99, the PlayStation 3D Glasses are more affordable than most Active 3D glasses on the market. Are the new 3D Glasses universal? Yes. The new 3D Glasses are universally compatible with Sony, Samsung, Panasonic, Mitsubishi, Toshiba, and Sharp ACTIVE Shutter 3D ready displays that use IR emitters; however, we do not guarantee its performance on other TV/monitors. How fast do the built-in rechargeable batteries charge? The glasses are fully rechargeable via the included micro-USB cable. If you need a quick charge, three minutes of charge will get you approximately three hours of 3D play. If you want a full charge, 30 minutes of charge will get you approximately 30 hours of 3D play. What is crosstalk and how do the 3D Glasses minimize crosstalk? Crosstalk is 3D distortion that occurs when active 3D glasses are not communicating properly with the 3D display. This occurs most often when a user is watching 3D content and the glasses are not in a “normal” viewing angle (for example if you’re laying down on the couch sideways and your head is tilted). With the 240Hz refresh on 3D Display and 3D Glasses, this effect is minimized. Are these 3D Glasses meant only for gaming? No, they excel with 3D content of all types. While the glasses have been optimized for the 3D gaming experience, they offer best-in-class 3D quality. What do the buttons on the 3D Glasses do? You can turn on the 3D Glasses by simply sliding the battery switch on, which appears on the front inner right ear piece. Once the glasses are on, and you’re playing a SimulView-enabled game, you can switch between the 1st player and 2nd player view at any time by pressing the small circular power button, which appears on the top of the glasses above your nose bridge. If you hold the small circle power button for several seconds, you will power down the glasses. Directly to the right of the small circle power button lies the micro-USB port, which enables you to recharge the glasses. It’s currently available for pre-order in Canada at participating retailers. The 3D Display is not equipped with an internal TV tuner or antenna, though it will support video input from an HDMI- or component-compatible cable box. Contact your local cable provider for technical specifics related to receiving television programming. Yes. The only requirement is that the output from the PC needs to be HDMI standard format. The 3D Display can be titled backward by 10 degrees. Yes. It will support the new PS3 Remote Control. The two images are in fullscreen 2D. The 3D technology is used to separate the image into two distinct 2D views. No. The design does not accommodate a wall-mounting bracket. No. The display has integrated controls on the back of the panel, but does not include a remote. It does, however, support the new PS3 Remote Control. Can I use another gaming console on the 3D Display? Yes. 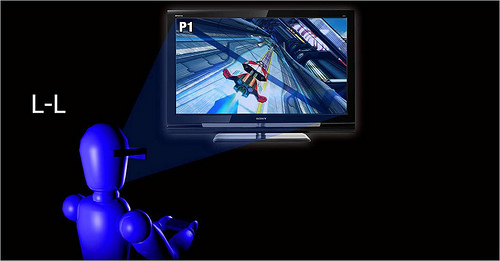 The 3D Display supports any HD gaming console. Will there be bigger screen sizes available in the future? PlayStation is evaluating different possibilities, but there is nothing to share at this time. The PlayStation 3D Display will be available in Canada, Europe, and key areas of Asia, including Japan. No. SimulView support is currently limited to a SimulView-enabled game on the PS3. Does the 3D Display require a separate 3D emitter? No, you will not need to purchase a separate 3D emitter. 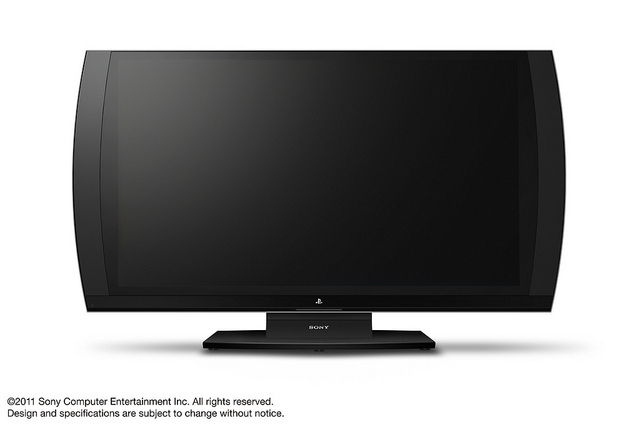 The 3D Display features a built-in 3D emitter that integrates seamlessly with the unit – you won’t even know it’s there.